Pat Kennedy and Mike Shaw talk about Mike’s road to recovery. UBC Okanagan held its annual athletic scholarship breakfast on Friday where inspiration took centre-stage. Olympic athletes, varsity players, local dignitaries and the community gathered to listen to former freestyle skier Mike Shaw as he explained his journey from devastating skiing accident to learning to walk again. Shaw, a UBC alumnus who lives in Lake Country, broke his neck in a ski accident in December 2013. As a special guest at the 13thannual Valley First/UBC Okanagan Athletics Scholarship Breakfast, Shaw showed a video of the accident and shared the story of his recovery including his first steps, his first time in a sit-ski and finally heli-skiing. Shaw wasn’t the only story of inspiration at the fundraising breakfast. Three members of Canada’s Winter 2018 Olympic team were on hand. Gold medallist and UBC Okanagan human kinetics student Kelsey Serwa, ski-cross athlete and UBC Okanagan graduate Ian Deans and UBC Okanagan’s Head Athletic Therapist Jeff Thorburn received a round of applause. The giving didn’t stop there. Long-time supporters Lois and Cliff Serwa presented a gift of $150,000 to the Okanagan campus. The funds will support a new basketball scholarship and a reading room in the new Teaching and Learning Centre will bear the Serwa family name. While the purpose of the event is to raise funds for athletic scholarships, it was also a chance to recognize and congratulate the accomplishments of the Heat athletes. It was another stellar season for the Heat. The women’s volleyball team, for the fifth year in a row, advanced to the semi-final round in Canada West playoffs and enjoyed their second trip to the national championship. Meanwhile, the men’s golf team captured its first-ever national silver medal, collecting a provincial silver on their way to the finals in October. Soccer’s Mitch McCaw set a new Canada West record with 685 consecutive minutes without surrendering a goal. He was also the Canada West star for three straight weeks during this run. And cross-country runner Veronika Fagan was the fastest in Canada winning the national championship race and bringing home a national individual medal. She was also named Heat’s most outstanding female player of the year. Fagan, a third-year nursing student who grew up in Kelowna, used the podium at the Athletics breakfast to thank the School of Nursing for its flexibility and support while she competed, and also thanked the community for contributing to the scholarship endowment. UBC Okanagan’s Deputy Vice-Chancellor and Principal Deborah Buszard also took the time to thank the community for its continued support. 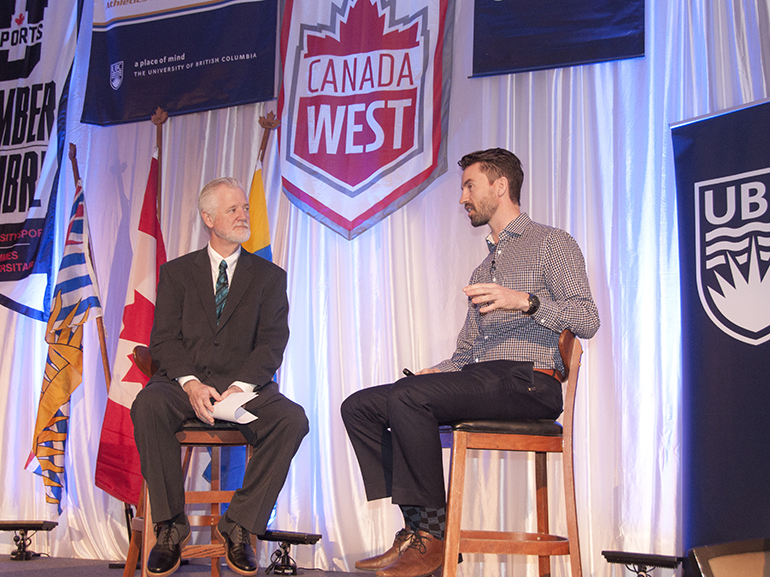 The breakfast was also an opportunity to introduce UBC Okanagan’s new director of Athletics and Recreation Tom Huisman. Currently manager of Interuniversity Sport Program at Carleton University, Huisman begins his new role May 1.